WE'RE GOING GREEN WITH SOLAR ELECTRICITY! Copper Crest Farm, a 5th generation family farm, is excited to be Going Green. Showing the respect to her family's land and to her community by installing an Earth friendly system is important to Pam Umberger, owner and operator of Copper Crest Farm. She has grown much of her own produce for years and has been an active advocate of buying local organic produce, supplementing her pantry with the farmer's market and local businesses. Her son sells organic vegetables, which he grows on the farm. 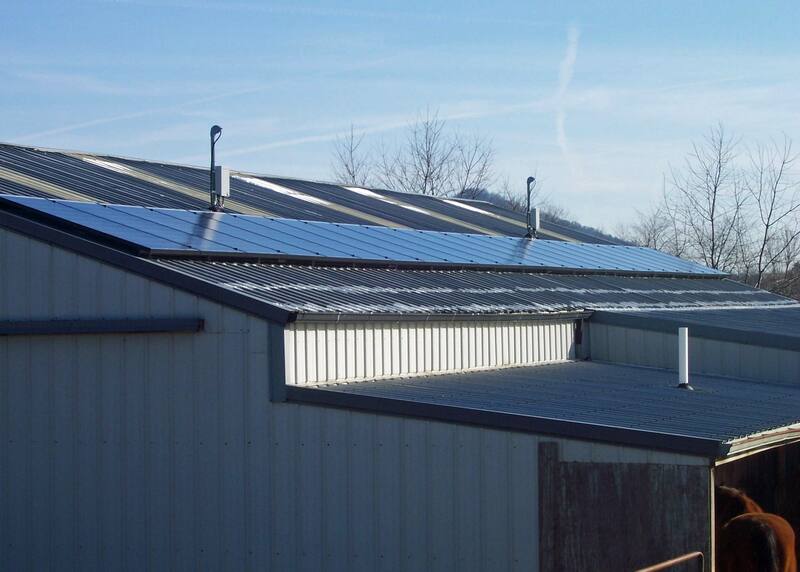 The back of the Copper Crest Farm barn has been equipped with Solar Panels to provide the majority of the business facility with solar electricity. As well as much of the barn, the business office and its computer equipment have also been switched over to the solar system. Since the water pump is now solar powered, the water troughs can now be filled even during local power outages. Copper Crest Farm is very proud to be helping the environment and its local community, while also providing a welcoming facility for its clients and consistent care and well-being of the horses on the farm! 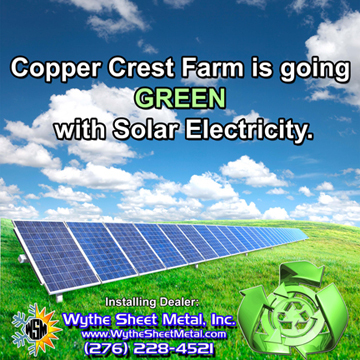 Wythe Sheet Metal, Inc. in Wytheville, Virginia set-up and installed the solar power system at Copper Crest Farm. They were informative and very cooperative to work with during the process. We highly recommend them to others interested in Going Green. WSM can be contacted by phone, 276-228-4521, or from their website, www.wythesheetmetal.com. Testimonials given by Copper Crest Farm clients. This site uses an Email Form page to reduce spam. Website developed and maintained by Sam Pob Web Design. Copyright© 2001-2016 Copper Crest Farm.